Devi (Chennai, India) on 26 September 2014 in Animal & Insect and Portfolio. I understand very well the idea of ​​a gardener. I did not want them in my house. @Jypyä Pop: You are right Jypya.. why invite trouble!!! There are so wildly in appearance, I hope that they will soon disappear from the garden!:-)))))))))))))))Haleja. Happy Friday ,my good friend! @Oiva: They are disappearing from here today....ha ha ha !!!! Fascinating to watch - preferably from behind glass ! Devi, thanks for sharing this series ---- but I agree with Ronnie --- better from behind glass. !!! Thanks for documenting these little creatures' work. Amazing what they can do, isn't it? Merveilleuse image qul rendu sur ces feuilles avec la petite touche d'orange superbe. 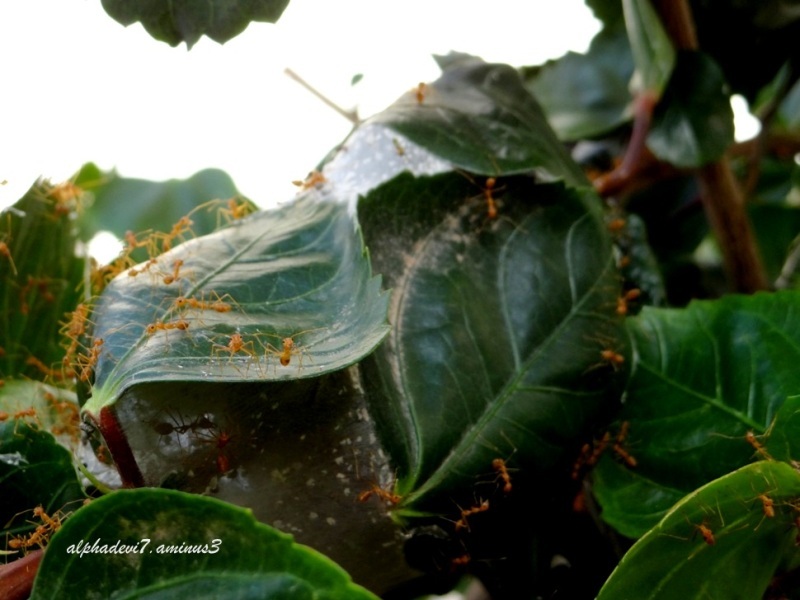 Very impressive these ants, excellent composition and great shot. The gardener has had a good initiative to cut and discard the branch when there are in the house, it's hard to get rid. Wow, that's a very good "Bachaco" Series.